"They" say that if you go on a diet, you should never tell anyone about it. Why? Because then the haters, naysayers, and sabotage-ers (saboteurs) come out of the woodwork. I must say, that in my experience, what "they" say is true...tis so very true. I think the whole "hatin'" thing could be there amongst men too, but I know that as a woman, I definitely know that it's there, sometimes among people closest to you. "Have you eaten anything today? Because if not, you should at least eat a salad." "You've only had soup today? Well, you know if you don't eat anything, that's gonna cause you to gain more weight." "We're never gonna be no real skinny girls..."
And on and on it goes. Bottom line, if you ask me, it is sabotage. I feel that deep down, certain people just do not want to see you have success on a diet, because then that makes them look bad, especially if it is a friend that you hang out with on a daily basis. I really hate to talk like this about my girls, because I like them, and to be fair, some of them do support my efforts to get fit by summer (original goal was Spring, but hey, Spring is almost here already), but I feel like they hate on progress that they feel is intimidating to them. Me, I'm not perfect, but I'm no hater either. If you are getting your shine on, then by all means continue to get that shine for yourself. Unfortunately, everyone does not feel like that. These days, to stay committed to a diet, you have to battle your food cravings, your friends, and sometimes even family. Just have to pray and try to stick with it. Last edited by Striver; 05-01-2017, 05:54 PM. Some people find the opposite to be true. Sometimes you shouldn't tell *everyone,* of course, because of those naysayers. Other times, though, it holds you more accountable. Because people know you're dieting, you feel like you should produce more results or that they're judging when you eat that extra slice of cake, etc. Sometimes your real friends will be supportive by not pressuring you to eat more, too. I agree with you, in that some people will be supportive; as I said towards the end of my journal entry, some of them do support my efforts. What I find ironic (in my own particular case), is that the friends I naturally assume would be supportive, turn out to be the saboteurs, and the friends who I think are going to spew the most hate. turn out to be supportive. Go figure. I wonder, if certain people are not supportive, does that mean that deep-down inside they are not my real friends, or does that mean that they are just really uncomfortable with certain types of change that they might feel threatened by? I agree that telling certain people can definitely help with the accountability quotient; and I must say that it has been an experience as well as an experiment of sorts (albeit an unintentional experiment) to learn which friends I can tell about my diet, and which friends I should not tell. C'est la vie. You live, you learn. Last edited by Striver; 02-19-2013, 09:03 PM. I really want a smoothie right now. I have all the ingredients that I need to make myself something nice and delicious to drink, only thing is, it's waaay too early in the morning to turn on a blender right now. Also, I kind of want something hot to drink; drinking hot stuff in the morning is one of life's greatest pleasures, if you ask me. Still have not fixed myself the smoothie that I was craving earlier. I totally forgot all about it. In the meantime, I have eaten nachos, and peanuts, and even drank some apple cider vinegar for health purposes. I don't think it's indicative of being a good friend or not. Sometimes, they aren't that supportive because they don't know how to be. Or that when they try to lose weight, that's how people are to them, so that's how they act. If they intentionally try to sabotage to you, though, well then that's something to be a little more concerned about. Hmm, kind of stuck to my diet yesterday, but still no workout. Let's see how the day goes. Cool that you made a thread Striver. I can see how you want support from others. You don't want to feel like you're going it alone. Yes, I agree with you about being more concerned if someone intentionally tries to sabotage me. The other week, when I was right in the midst of a diet that was going really good, I was at a friend's house. She had just cooked some soup, a brand new recipe and she was adamant that I try just a little. "It's a new recipe, you have to taste it and tell me what you think." In this particular friends case, I think it was intentional sabotage, but she would never admit it because since she felt like I wasn't going to stick to my diet anyway, aggressively offering me soup was not doing any harm..."It's healthy." I agree that some people aren't supportive because they don't know how to be. I find that a lot of the people I know are used to being told that they can't do this, or that they'll never be able to that. When I mention that I'm on a diet, they don't believe that I can follow through with it, because they've rarely received support in their efforts. I think my best course of action, at this point, is just to keep quiet about my intentions. That's one of the reasons why I started a fitness journal here, so that I can "talk" to my (own) self about things. But are you sure she was really trying to sabotage you there? I mean...it's soup....was it a healthy soup? Does she like cooking and having people try her new recipes? Was it really only a small amount that she wanted you to sample? She may have just been really excited about it and wasn't trying to hurt you at all. I'm glad I started a thread here also, somewhere to write down more of my thoughts about dieting and exercise (or the lack thereof). To be honest, I did not start this thread to get support from others (although I appreciate the support that I get) as much as I started this thread to have somewhere to kind of talk about things that I don't want to talk to real-life friends about. I started this thread because I noticed that certain people that I associate with in the real world (as opposed to this virtual world), seem to make it their mission to try to get me to eat certain things when I say, "I'm not eating today, just drinking liquids." I realized that I need to start having more conversations with myself about my diet, as opposed to having conversations with everyone else. This forum seemed like a good place to write down certain things instead of talking so much to friends, who seem to make it their task to try and get me to eat. Yes, I know my friend... What I find interesting is how different aspects of my friends' (plural) personalities come out when mention of a "diet" is thrown into the mix. This particular friend has not taken my diet seriously since I first mentioned it weeks ago (documented here at this forum in Cthulhu's workout...). To her it was not a matter of if I was going to stop the diet, but when. She says she has some diet pills that she can get me that worked wonders for her. She told me she used to be really heavy. I don't know how big she used to be, because I did not know her "then", however, a mutual friend of ours, who did know her 'back then' mentioned to me a while back about how big this particular woman used to be. From the time I mentioned my diet, she has been convinced that my not eating was NOT going to work, but that her pills would. I have no clue what kind of pills she's even talking about, because I have no interest in taking pills. 1) I don't do diet pills, and 2) If I do take them, and lose weight, she is the type that will try to take credit for my weight loss (i.e. tell everyone that I lost so much weight because of the pills she gave me) even though I would be the one that put the work in--in conjunction with the pills. As far as the soup goes, yes, it was pretty healthy soup. Yes, she likes to cook, and I think that she likes for people to try out her recipes... she certainly wanted me to try that soup. And, yes, it was only a small sample. But she and I had been having the conversation daily (I work with her) about how I wasn't eating any solids for awhile. She was adamant, "You have to eat," like a broken record. And yes, I think that she was kind of excited about the new recipe, but I feel that she was kind of on a mission to "make me" eat (every day, "What did you eat today?"). I ate the soup, and it was okay (the first cup tasted much better than the second cup, for some reason), but not because she made me, but because I like to eat. The key for me is to really take my diet seriously. No one else is going to do that for me. If I take my diet seriously, and if I take seriously my quest to lose weight by summer, then it won't matter who (whom?) offers me what, I'll still turn it down. I know it's up to me. Last edited by Striver; 02-24-2013, 05:30 PM. Well, yesterday was kind of a good day for my diet. I was off from work so much last week that my paycheck was small and therefore, I was not able to spend as much money on 'weekend food' as perhaps I would have, had I had the funds. Today, I feel pretty good. I really want a pizza if you want to know the truth. Derek (from this forum) is probably somewhere eating some bean sprouts sprinkled with cracked pepper, and calling it a day. 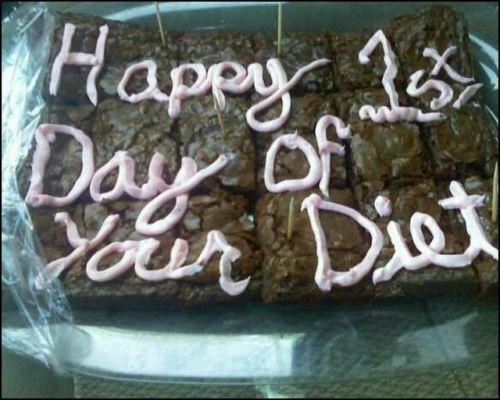 It is admirable how some people stick to a certain diet. I found a workout pamphlet that has a pictures of a series of exercises that one can do, with weights. I need to get on that. I hung the pamphlet on my bathroom door to remind me to workout. I have the weights, so I just need to get busy and "act". Reading about some of the exercises that certain people do here on this forum, and how I don't do anything near that, makes me want to step my game up. It sounds like maybe you should limit your time with this friend for now then. Whatever the motives, they're not helping you any and it sounds like they make it more stressful for you, too. Uuugghhh! This is horrible... but really funny! All that icing on top almost ruins it for me, however, I'd probably still eat it, lol. Yes, I might need to limit my time around this friend, however she and I work together... I see her 5 days a week, lol!! You're right, sometimes dealing with people who have their own ideas about what I should eat gets stressful, but I have learned just to keep some info to myself around certain people. I know that I have to be strong though, whether it comes to dealing with friends, or with the fact that there is a restaurant on every corner, or whatever the challenge may be in my quest towards greater fitness. I checked out Quirky Cookery (now there's a place I shouldn't visit often, lol). Lots of great stuff there. Last edited by Striver; 02-26-2013, 09:12 AM.